본 발명의 경화성 오가노폴리실록산 조성물은 화학식 1의 오가노폴리실록산(A), 화학식 2의 평균 단위식의 오가노폴리실록산(B), 1개 분자 중에 평균 2개 이상의 규소-결합된 아릴 그룹과 평균 2개 이상의 규소-결합된 수소 원자를 갖는 오가노폴리실록산(C) 및 하이드로실릴화 반응 촉매(D)를 적어도 포함하고; The curable organopolysiloxane composition of the present invention organopolysiloxane (A), on average at least two silicon in the average organopolysiloxane (B), one of the units of formula molecule of formula 2 of the formula-bound aryl group and an average of 2 one or more silicon-containing the organopolysiloxane (C) and the hydrosilylation reaction catalyst (D) with a bonded hydrogen atom and at least; 우수한 충전성과 경화성을 특징으로 하며; Characterized excellent charging performance, and curing; 경화되면, 높은 굴절률, 높은 광투과율 및 각종 기재에 대한 강력한 접착성을 보유하는 경화물을 형성한다. When cured, it forms a cured product that has strong adhesion to the high refractive index, high light transmittance, and various substrates. "a", "b" 및 "c"는 특정 수이다. "A", "b" and "c" is a specific number. 본 발명은 경화성 오가노폴리실록산 조성물 및 반도체 디바이스에 관한 것이다. The present invention relates to a curable organopolysiloxane composition and semiconductor device. 더욱 상세하게는, 본 발명은 우수한 경화성을 보유하며, 경화되면, 높은 굴절률, 높은 광투과율 및 각종 기재에 대한 강력한 접착성을 갖는 경화물을 형성하는 경화성 오가노폴리실록산 조성물에 관한 것이다. More particularly, the present invention holds excellent curability, when cured, to a high refractive index, high light transmittance and a curable organopolysiloxane composition that forms a cured product having a strong adhesion to various substrates. 본 발명은 또한 신뢰성이 우수한 반도체 디바이스에 관한 것이다. The invention also relates to a semiconductor device of superior reliability. 하이드로실릴화 반응에 의해 경화될 수 있는 경화성 오가노폴리실록산 조성물은, 광커플러, 발광 다이오드, 고체 이미징 소자, 또는 반도체 디바이스에 있어서의 유사한 광학 반도체 소자 위의 보호 피복물를 형성하는 데 사용된다. Hydrosilylation reaction-curable organopolysiloxane composition which can be cured by means of is used for forming the above protective pibokmulreul similar optical semiconductor element of the optical coupler, the light emitting diode, solid-state imaging device, or a semiconductor device. 이러한 반도체 소자용 보호 피복물는 상기한 소자에 의해 생성되거나 수용된 광을 흡수하지 않아야 하고 이들 광을 소산(dissipation)시키지 않아야 하는 것이 요구된다. Pibokmulneun for protecting the semiconductor element should not be created or absorb light received by said one device, and it is required to dissipate should not (dissipation) of these light. 하이드로실릴화 반응에 의해 경화되고 높은 굴절률과 높은 광투과성을 갖는 경화물을 형성하는 경화성 오가노폴리실록산 조성물로는, 페닐 그룹과 알케닐 그룹 을 갖는 오가노폴리실록산, 오가노하이드로겐사이클로실록산 및 하이드로실릴화 반응 촉매를 포함하는 경화성 오가노폴리실록산 조성물[참조: 일본 미심사 특허공보(이하 "공개공보"라 함) 제(평)08-176447호]; Hydrosilylation curable organosilane screen that is curable by the reaction and form a cured product having a high refractive index and high light transmittance organopolysiloxane composition as is, the organosilane having a phenyl group and the alkenyl group, organopolysiloxane, organo hydrogen cyclosiloxanes and hydrosilylation Chemistry curable organopolysiloxane composition containing a catalyst [see: Japanese Unexamined Patent Publication (hereinafter referred to as "Publication No." hereinafter) of claim Hei 08-176447 call; 페닐 그룹과 알케닐 그룹을 함유하고 25℃에서의 점도가 10,000mPaㆍs 이상인 액상 또는 고체의 오가노폴리실록산, 1개 분자 중에 2개 이상의 규소-결합된 수소 원자를 갖는 오가노하이드로겐폴리실록산 및 하이드로실릴화 촉매를 포함하는 경화성 오가노폴리실록산 조성물[참조: 일본 공개공보 제(평)11-1619호]; Organohydrogenpolysiloxane and having a hydro-bonded hydrogen atom-containing phenyl group, and alkenyl group, and at least two silicon in a viscosity at 25 ℃ organopolysiloxane, one or more molecules of a liquid or solid 10,000mPa · s containing the silylated catalyst-curing organopolysiloxane composition [reference: Japanese Laid-Open Publication No. Hei 11-1619 call; 및 아릴 그룹과 알케닐 그룹을 갖는 오가노폴리실록산, 1개 분자 중에 2개 이상의 규소-결합된 수소 원자를 갖는 오가노폴리실록산, 및 아릴 함유 오가노실록산 올리고머의 백금 착체 형태의 촉매를 포함하는 경화성 오가노폴리실록산 조성물[참조: 일본 공개특허공보 제2003-128992호]이 예시될 수 있다. And organopolysiloxane, at least two silicon in one molecule having an aryl group and an alkenyl group-curable containing organopolysiloxane, and an aryl-containing organosiloxane oligomers of the platinum complex in the form of a catalyst having a bonded hydrogen atom Ogaki organopolysiloxane composition [reference: Application No. 2003-128992 Japanese Unexamined Patent Publication] can be exemplified. 그러나, 상기한 경화성 오가노폴리실록산 조성물은 점도가 높아서 충전성(fillability)이 불량하다. However, the above-described curable organopolysiloxane compositions are the filling factor (fillability) poor high viscosity. 추가로, 이들은 경화 반응 온도가 높으므로 경화성이 불량하다. In addition, it has high curability is poor because the curing reaction temperature. 본 발명의 목적은, 우수한 충전성 및 경화성을 특징으로 하고, 경화되면, 높은 굴절률, 높은 광투과율 및 각종 기재에 대한 강력한 접착성을 보유하는 경화물을 형성하는, 경화성 오가노폴리실록산 조성물을 제공하는 것이다. An object of the present invention, an excellent filling property, and characterized by the curing, and when cured, a high refractive index, which provides a high light transmittance and, the curable organopolysiloxane composition that forms a cured product that has strong adhesion to various substrates will be. 또 다른 목적은, 상기한 조성물을 사용하여 제조되고 우수한 신뢰성을 보유하는 반도체 디바이스를 제공하는 것이다. Still another object is to provide a semiconductor device having an excellent reliability and manufacturing using the above composition. 하이드로실릴화 반응 촉매(D)(당해 조성물을 경화시키기에 충분한 양으로 사용된다)를 적어도 포함한다. A hydrosilylation reaction catalyst (D) (used in an amount sufficient to cure the composition) comprises at least. "a", "b" 및 "c"는 각각 0.30≤a≤0.60, 0.30≤b≤0.55, (a＋b＋c)=1 및 0.10≤[c/(a＋b)]≤0.30의 조건을 만족시키는 수여야 한다. "A", "b" and "c" should be a number satisfying the respective 0.30≤a≤0.60, 0.30≤b≤0.55, (a + b + c) = 1 and 0.10≤ [c / (a ​​+ b)] conditions of ≤0.30 . 본 발명의 반도체 디바이스는, 본 발명의 경화성 오가노폴리실록산 조성물의 경화물로 피복된 반도체 소자를 갖는다. A semiconductor device of the present invention has a semiconductor element coated with a cured product of the present invention, the curable organopolysiloxane composition. 본 발명의 경화성 오가노폴리실록산 조성물은 우수한 충전성과 경화성을 특징으로 하고, 당해 조성물의 경화물은 높은 굴절률, 높은 광투과율 및 기재에 대한 강력한 접착성을 특징으로 한다. The curable organopolysiloxane composition is characterized by a superior charging and curing, and a cured product of the composition of the present invention is characterized by strong adhesion to the high refractive index, high light transmittance and a base. 추가로, 상기한 조성물을 사용하여 제조한 본 발명의 반도체 디바이스는 높은 신뢰성을 특징으로 한다. In addition, the semiconductor device of the present invention prepared using the above-described composition is characterized by a high reliability. 도 1은 본 발명의 반도체 디바이스의 일례로서 표면 실장형 발광 다이오드(LED)의 단면도이다. 1 is a cross-sectional view of the surface mount light-emitting diode (LED) as an example of the semiconductor device of the present invention. 먼저, 본 발명의 경화성 오가노폴리실록산 조성물을 보다 상세히 설명한다. First, a description in greater detail of the curable organopolysiloxane composition of the present invention. 성분(A)를 구성하는 오가노폴리실록산은 경화성을 향상시키고 이의 점도를 감소시키는 당해 조성물의 주 성분이다. Organopolysiloxane constituting the component (A) is a main component of the composition to improve the curability and reduces the viscosity thereof. 당해 성분은 화학식 1로 나타낸다. This component is represented by the formula (I). 상기 화학식 1에서, R 1 은 동일하거나 상이하며 치환되거나 치환되지 않은 1가 탄화수소 그룹, 예를 들면, 메틸, 에틸, 프로필, 부틸, 펜틸, 헥실, 헵틸 또는 유사한 알킬 그룹; In Formula 1, R 1 is the same or different and each is a substituted or unsubstituted monovalent hydrocarbon group, e.g., methyl, ethyl, propyl, butyl, pentyl, hexyl, heptyl, or similar alkyl groups; 비닐, 알릴, 부테닐, 펜테닐, 헥세닐 또는 유사한 알케닐 그룹; Vinyl, allyl, butenyl, pentenyl, hexenyl, or similar alkenyl groups; 페닐, 톨릴, 크실릴, 나프틸 또는 유사한 아릴 그룹; Phenyl, tolyl, xylyl, naphthyl, or similar aryl groups; 벤질, 펜에틸 또한 유사한 아르알킬 그룹; Benzyl, phenethyl also similar aralkyl group; 클로로메틸, 3-클로로프로필, 3,3,3-트리플루오로프로필 또는 유사한 할로겐화 알킬 그룹일 수 있다. Chloro may be methyl, 3-chloropropyl, 3,3,3-trifluoropropyl, or similar halogenated alkyl groups. 이들 중에서, 메틸, 비닐 및 페닐 그룹이 바람직하다. Of these, methyl, vinyl and phenyl groups are preferred. 그러나, 본 발명의 조성물에 충분한 경화성을 부여하기 위해, 1개 분자 중에서 2개 이상의 R 1 (규소-결합된 유기 그룹)이 알케닐 그룹이어야 한다. However, in order to give sufficient curability to the composition of the present invention, more than one R 2 in one molecule 1 (silicon-bonded organic groups) it is to be an alkenyl group. 특히, 당해 알케닐 그룹은 비닐 그룹인 것이 바람직하다. In particular, the art alkenyl group is preferably vinyl group. 또한, 본 발명의 조성물을 경화시켜 수득한 경화물에서의 광의 굴절 및 산란에 의해 유발된 광의 감쇠의 측면에서, 1개 분자 중에서 R 1 (모두 규소-결합된 유기 그룹) 중의 1개 이상이 아릴 그룹인 것이 권고되고, 가장 바람직하게는 당해 아릴 그룹은 페닐 그룹이다. Further, in view of the light attenuation caused by the refraction and scattering of the cured product obtained by curing the composition of the present invention, R 1 in one molecule at least one (both silicon group combined organic) aryl that the group is recommended, and most preferably the art aryl group is phenyl group. 상기한 화학식 1에서, "m"은 0 내지 100의 정수이며, 바람직하게는 1 내지 100의 정수, 더욱 바람직하게는 2 내지 100의 정수, 특히 바람직하게는 2 내지 50의 정수이다. In the above Formula 1, "m" is an integer from 0 to 100, preferably from 1 to 100 integer, and more preferably an integer of 2 to 100, particularly preferably an integer of 2 to 50. "m"의 값이 권고된 범위의 하한 미만인 경우, 수득된 경화물의 가요성이 저하되거나 기재에 대한 접착성이 저하되는 경향이 있을 수 있다. If the value of "m" is less than the lower limit of the recommended range, the obtained cured product flexibility may be degraded, or there may be a tendency for the adhesion to the substrate decreases. 한편, "m"의 값이 권고된 범위의 상한을 초과하는 경우, 충전성이 저하되거나 수득된 경화물의 기계적 특성이 손상되는 경향이 있을 수 있다. On the other hand, if the value of "m" exceeds the upper limit of the recommended range, may tend to be degraded, or the filling factor of the obtained cured the damaged the mechanical properties of water. 전술한 성분(A)로는 하기 화학식의 오가노폴리실록산이 예시되며, 이들 화학식에서 "m"은 2 내지 100 범위의 정수이고, m' 및 m"는 각각 1 내지 99 범위의 정수이며, 단 (m'＋m")는 2 내지 100 범위의 정수이다. And roneun (A) the above-described components is illustrated the organopolysiloxane of the formula, in these formula "m" is 2 to integer from 100 range, m 'and m "are each an integer from 1 to 99 range, with the proviso that (m '+ m ") is an integer ranging from 2 to 100. 특히, 경화성을 향상시키기 위해, 분자 말단의 규소 원자에 결합된 알케닐 그룹을 갖는 오가노폴리실록산을 성분(A)로서 사용하는 것이 권고된다. In particular, it is recommended to use an organopolysiloxane having an alkenyl group bonded to the silicon atoms of the molecular terminal ends to enhance the curing as the component (A). 성분(B)를 구성하는 오가노폴리실록산은, 본 발명의 조성물의 경화성을 향상시키고 유연한 경화물을 수득하기 위해 사용되는 주성분이다. Organopolysiloxane constituting the component (B) is a main component improves the curability of the composition was used to obtain a flexible cured product. 당해 성분은 화학식 2의 평균 단위식으로 나타낸다. This component is represented by the average unit formula of the formula (2). 상기 화학식 2에서, R 2 는 동일하거나 상이하며 치환되거나 치환되지 않은 1가 탄화수소 그룹일 수 있고, 상기한 R 1 에 대해 제시된 바와 동일한 1가 탄화수소 그룹이 예시되며, 이들 중에서 메틸, 비닐 및 페닐 그룹이 가장 바람직하다. In Formula 2, R 2 may be the same or different and each is a monovalent hydrocarbon group optionally substituted, is the same one shown for the above R 1 exemplified hydrocarbon groups, methyl Among these, vinyl and phenyl group, this is the most preferred. 그러나, 충분한 경화성을 제공하기 위해, R 2 중의 0.5mol% 이상은 알케닐 그룹이어야 하고, 비닐 그룹인 것이 가장 바람직하다. However, to provide sufficient curability, 0.5mol% or more of R 2 must be alkenyl groups, and most preferably a vinyl group. 경화물에서의 광의 굴절, 광의 반사 및 산란에 의한 광의 감소된 감쇠의 측면에서, R 2 중의 25mol% 이상, 바람직하게는 40mol% 이상, 특히 바람직하게는 45mol% 이상이 아릴 그룹인 것이 권고된다. In terms of a reduced attenuation of light by the light refraction, light reflection and scattering of the cured product, R 2 of 25mol% or more, preferably 40mol% is more, particularly preferably it is recommended that the at least 45mol% is an aryl group. 단위 화학식 R 2 SiO 3 /2 의 실록산 그룹 중의 R 2 는 아릴 그룹, 특히 페닐 그룹인 것이 바람직하다. R 2 of the siloxane groups of the unit formula R 2 SiO 3/2 is preferably an aryl group, especially phenyl group. 추가로, 상기한 실록산 단위식 R 2 2 SiO 2 /2 중의 R 2 는 알킬 그룹 및/또는 아릴 그룹, 특히 메틸 그룹 및/또는 페닐 그룹인 것이 바람직하다. In addition, the above-mentioned siloxane unit formula R 2 2 SiO 2/2 R 2 of is preferably in the alkyl group and / or aryl groups, especially methyl groups, and / or phenyl group. 상기한 실록산 단위는 화학식 C 6 H 5 (CH 3 )SiO 2/2 의 실록산 단위, 화학식 (C 6 H 5 ) 2 SiO 2 /2 의 실록산 단위 또는 화학식 (CH 3 ) 2 SiO 2 /2 의 실록산 단위로 예시될 수 있다. Wherein the siloxane unit has the formula C 6 H 5 (CH 3) SiO 2/2 siloxane units of the formula (C 6 H 5) 2 SiO 2/2 or a siloxane unit formula (CH 3) 2 SiO 2 of a siloxane / 2 It can be illustrated as a unit. 추가로, 화학식 R 2 3 SiO 1 /2 의 실록산 단위는 1개 이상의 R 2 를 알케닐 그룹으로서 갖고 나머지 R 2 가 알킬 그룹 및/또는 아릴 그룹으로부터 선택될 수 있다. Additionally, a siloxane unit of formula R 2 3 SiO 1/2 has an alkenyl group know at least one R 2 is the rest of R 2 may be selected from alkyl groups and / or aryl group. 1개 이상의 R 2 가 비닐 그룹이고 나머지 R 2 가 메틸 및 페닐 그룹으로부터 선택된 실록산 단위가 가장 바람직하다. 2 is a vinyl group or more R 1 and the remaining R 2 is most preferably a siloxane unit selected from methyl and phenyl groups. 이러한 실록산 단위로는 화학식 (CH 2 =CH)(CH 3 ) 2 SiO 1 /2 의 실록산 단위가 예시된다. These siloxane units are exemplified by siloxane units of formula (CH 2 = CH) (CH 3) 2 SiO 1/2. 추가로, 화학식 R 2 3 SiO 1 /2 의 실록산 단위는, R 2 가 알킬 그룹 및/또는 아릴 그룹인 실록산 단위, 특히, R 2 가 메틸 그룹 및/또는 페닐 그룹인 실록산 단위를 포함할 수도 있다. In addition, the siloxane units of the formula R 2 3 SiO 1/2 is a, R 2 a may comprise a siloxane unit of the alkyl group and / or aryl groups of the siloxane units, in particular, R 2 is a methyl group and / or phenyl group . 이러한 실록산 단위는, 화학식 (CH 3 ) 3 SiO 1 /2 및 화학식 C 6 H 5 (CH 3 ) 2 SiO 1 /2 로 나타낼 수 있다. The siloxane units can be represented by the general formula (CH 3) 3 SiO 1/ 2 ) and (C 6 H 5 (CH 3) 2 SiO 1/2. 상기한 화학식 2에서, "a", "b" 및 "c"는 0.30≤a≤0.60, 0.30≤b≤0.55, (a＋b＋c)=1.00 및 0.10≤[c/(a＋b)]≤0.30의 조건을 충족시키는 수이다. In the above formula (2), the "a", "b" and "c" is 0.30≤a≤0.60, 0.30≤b≤0.55, (a + b + c) = 1.00 and 0.10≤ [c / (a ​​+ b)] conditions of ≤0.30 It is able to meet. 상기한 성분(B)의 25℃에서의 점도는 특별히 한정되지 않지만, 10 내지 1,000,000mPaㆍs, 특히 100 내지 50,000mPaㆍs의 범위가 권고된다. Viscosity at 25 ℃ of the aforementioned component (B) is not particularly limited, but a range of 10 to 1,000,000mPa · s, especially 100 to 50,000mPa · s is recommended. 당해 점도가 권고된 범위의 하한 미만인 경우, 당해 조성물을 경화시켜 수득한 경화물의 기계적 특성이 저하될 것이고, 한편, 당해 점도가 권고된 범위의 상한을 초과하는 경우, 수득된 조성물의 충전성이 손상될 것이다. Is less than of the art the viscosity recommended range lower limit, it will be a cured product of the mechanical properties obtained by curing the composition decreases. On the other hand, if it exceeds the upper limit of the art the viscosity recommended range, the filling factor of the damage of the resultant composition It will be. 유사하게는, 성분(B)의 분자량은 특별히 한정되지 않지만, 폴리스티렌을 기준으로 하는 질량 평균 분자량이 500 내지 10,000, 특히 700 내지 6,000 범위인 것이 권고된다. Similarly, the molecular weight of component (B) is not particularly limited, it is recommended that the weight average molecular weight using polystyrene as the standard of 500 to 10,000, especially 700 to 6,000 range. 당해 질량 평균 분자량이 권고된 범위의 하한 미만인 경우, 경화물의 기계적 특성이 손상될 것이고, 한편, 이러한 특성이 권고된 범위의 상한을 초과하는 경우, 수득된 조성물의 충전성이 손상될 것이다. If less than the lower limit of the recommended range of the art The weight average molecular weight, the cured product will be damaged mechanical properties. On the other hand, if it exceeds the upper limit of the recommended range, these characteristics will be the filling factor of the obtained composition damage. 본 발명의 조성물에서, 성분(B)는, 성분(A) 100질량부당 10질량부 이상, 바람직하게는 50질량부 이상, 더욱 바람직하게는 150질량부 이하, 가장 바람직하게는 120질량부 이하의 양으로 함유된다. In the present composition, component (B), component (A) 100 parts by mass per 10 parts by mass or more, preferably of not more than 50 parts by mass or more, more preferably 150 parts by mass or less, most preferably 120 parts by weight It is contained in an amount. 보다 구체적으로, 성분(B)는 성분(A) 100질량부당 10 내지 150질량부, 바람직하게는 10 내지 120질량부, 50 내지 120질량부, 또는 50 내지 150질량부 범위로 함유될 수 있다. More specifically, the component (B) may be contained as component (A) 100 parts by mass per 10 to 150 parts by weight, preferably from 10 to 120 parts by mass, 50 to 120 parts by mass, or 50 to 150 parts by weight range. 성분(B)의 함유량이 권고된 범위의 하한 미만인 경우, 수득된 조성물의 경화성이 손상되거나, 당해 조성물로부터 수득된 경화물의 기계적 특성이 저하될 것이다. If component (B) is less than the lower limit of the recommended range of the content of, or damage to curability of the obtained composition, a cured product of the mechanical properties obtained from the composition will be lowered. 한편, 성분(B)의 함유량이 권고된 범위의 상한을 초과하는 경우, 기재에 대한 경화물의 접착성이 손상될 것이다. On the other hand, if it exceeds the upper limit of the recommended range of the content of the component (B), it will be the adhesion of the cured product to a substrate damage. 성분(C)는 본 발명 조성물의 경화제이며, 이는 1개 분자 중에 평균 2개 이상의 규소-결합된 아릴 그룹 및 평균 2개 이상의 규소-결합된 수소 원자를 갖는 오가노폴리실록산을 포함한다. Component (C) is a curing agent composition of the present invention, which average at least two silicon in one molecule include an organopolysiloxane having a bonded hydrogen atom-bonded aryl groups and on average at least two silicon. 성분(C) 중의 규소-결합된 수소 원자의 결합 위치는, 분자 말단 및/또는 분자의 측쇄에 위치할 수 있다. Silicon in component (C) - coupling position of the bound hydrogen atoms, may be located in the side chain of the molecular end and / or molecules. 성분(C)에 함유된 규소-결합된 아릴 그룹으로는 페닐, 톨릴, 크실릴 및 나프틸 그룹이 예시될 수 있다. The silicon-containing component in (C) - coupling with the aryl group may be exemplified by phenyl, tolyl, xylyl and naphthyl groups. 페닐 그룹이 가장 바람직하다. The phenyl group being most preferred. 경화물을 통해 광이 투과되는 경우에 굴절, 반사 및 소산에 의해 유발되는 광의 감쇠를 감소시키기 위해, 성분(C)의 1개 분자에서 모든 규소-결합된 그룹 중의 아릴 그룹의 함유량은 10mol% 이상인 것이 권고된다. All the silicon in one molecule of the case where the light is transmitted in order to reduce light attenuation caused by refraction, reflection and dispersion in component (C) over the cured product - content of aryl groups in the combined groups is not less than 10mol% it is advised. 성분(C)의 다른 규소-결합된 그룹은 메틸, 에틸, 프로필, 부틸, 펜틸, 헥실, 헵틸 또는 유사한 알킬 그룹; Other silicon of component (C) - the combined group are methyl, ethyl, propyl, butyl, pentyl, hexyl, heptyl, or similar alkyl groups; 벤질, 펜에틸 또는 유사한 아르알킬 그룹; Benzyl, phenethyl, or similar aralkyl groups; 클로로메틸, 3-클로로프로필, 3,3,3-트리플루오로프로필 또는 유사한 할로겐 치환된 알킬 그룹을 포함할 수 있으며, 이들 중에서 메틸 그룹이 가장 바람직하다. Chloromethyl, 3-chloropropyl, 3,3,3-trifluoro may include a profile, or a similar halogen-substituted alkyl group, and most preferably the methyl group from the aforementioned. 성분(C)는 직쇄, 분지쇄, 사이클릭, 망상, 부분적으로 분지된 직쇄의 분자 구조를 가질 수 있다. Component (C) may have a molecular structure of straight, branched, cyclic, network, partially branched straight chain. 직쇄 구조가 바람직하다. A straight chain structure is preferred. 성분(C)의 25℃에서의 점도는 특별히 한정되지 않지만, 당해 점도는 1 내지 500,000mPaㆍs, 바람직하게는 1 내지 100,000mPaㆍs, 특히 바람직하게는 5 내지 100,000mPaㆍs 범위인 것이 권고된다. Viscosity at 25 ℃ of component (C) is not particularly limited, the art the viscosity is 1 to 500,000mPa · s, preferably from 1 to 100,000mPa · s, particularly preferably from 5 to recommended that 100,000mPa · s range do. 점도가 권고된 범위의 하한 미만인 경우, 당해 조성물로부터 수득된 경화물의 기계적 특성이 손상될 것이고, 점도가 권고된 범위의 상한을 초과하는 경우, 수득된 조성물의 충전성이 손상될 것이다. Is less than the lower limit of the viscosity of the recommended range, it will cause damage to the mechanical properties of the cured product obtained from the composition, if the viscosity exceeds the upper limit of the recommended range, it will be the filling factor of the obtained composition damage. 성분(C)의 오가노폴리실록산으로는, 분자쇄 양쪽 말단이 디메틸페닐실록시 그룹으로 봉쇄된(capped) 메틸하이드로겐폴리실록산; Component (C) organopolysiloxanes, the molecular chain, both ends of the dimethyl-phenyl group, a siloxy (capped) methyl hydrogen polysiloxane with the containment; 분자쇄 양쪽 말단이 디메틸페닐실록시 그룹으로 봉쇄된 디메틸실록산과 메틸하이드로겐실록산의 공중합체; Molecular chain, both ends of the dimethylphenyl siloxy copolymer of dimethyl siloxane and methyl hydrogen siloxane blocked with groups; 분자쇄 양쪽 말단이 트리메틸실록시 그룹으로 봉쇄된 디메틸실록산, 메틸하이드로겐실록산 및 메틸페닐실록산의 공중합체; Molecular chain, both ends of a trimethylsiloxy dimethyl siloxane, methyl hydrogen siloxane copolymer of methylphenylsiloxane and sealed into a group; 분자쇄 양쪽 말단이 디메틸하이드로겐실록시 그룹으로 봉쇄된 디메틸실록산과 메틸페닐실록산의 공중합체; The both ends of molecular chain, dimethyl hydrogen siloxy copolymer of dimethylsiloxane and methylphenylsiloxane with blocking group; 분자쇄 양쪽 말단이 디메틸하이드로겐실록시 그룹으로 봉쇄된 메틸페닐폴리실록산; The both ends of the molecular chain blocked by dimethyl hydrogen siloxy group, methylphenyl polysiloxane; 화학식 R 3 3 SiO 1 /2 의 실록산 단위, 화학식 R 3 2 HSiO 1 /2 의 실록산 단위 및 화학식 SiO 4 /2 의 실록산 단위로 이루어진 오가노폴리실록산의 공중합체; The general formula R 3 3 SiO copolymers of 1/2 siloxane units of the formula R 3 2 HSiO / 2 siloxane units of the formula SiO 4 and / organopolysiloxane composed of siloxane units of the two; 화학식 R 3 2 HSiO 1 /2 의 실록산 단위 및 화학식 SiO 4/2 의 실록산 단위로 이루어진 오가노폴리실록산의 공중합체; A copolymer of an organopolysiloxane composed of siloxane units of the formula R 3 2 HSiO siloxane units of 1/2) and (SiO 4/2; 화학식 R 3 HSiO 2 /2 의 실록산 단위 및 화학식 R 3 SiO 3 /2 의 실록산 단위 또는 화학식 HSiO 3 /2 의 실록산 단위로 이루어진 오가노폴리실록산의 공중합체; A copolymer of an organopolysiloxane composed of siloxane units of the formula R 3 HSiO 2/2 siloxane units, and the general formula R 3 SiO 3/2 or a siloxane unit formula HSiO 3/2; 및 이들 오가노폴리실록산의 2종 이상의 혼합물이 예시될 수 있다. And there are two or more kinds of mixtures of these organopolysiloxanes can be exemplified. 상기한 화학식에서, R 3 은 알킬, 아릴, 아르알킬 또는 할로겐-치환된 알킬 그룹이며, 이들은 상기와 동일한 그룹이 예시될 수 있다. In the above formula, R 3 is alkyl, aryl, aralkyl or halogen-substituted alkyl group, and, they may have the same group as the above can be exemplified. 그러나, R 3 으로 지정된 그룹의 평균 1개 이상은 아릴 그룹이어야 한다. However, an average of more than one group assigned to R 3 must be an aryl group. 바람직하게는, 이러한 아릴 그룹은 페닐 그룹이다. Preferably, this aryl group is phenyl group. 당해 조성물의 개선된 경화성의 측면에서, 성분(C)는, 1개 분자 중에 2개 이상의 규소-결합된 아릴 그룹을 갖고 분자쇄 양쪽 말단이 규소-결합된 수소 원자로 봉쇄된 직쇄 오가노폴리실록산을 포함해야 한다. In terms of improved curability of the composition, component (C), at least two silicon in one molecule comprises a bonded hydrogen atoms blocked linear organopolysiloxane-bonded has an aryl group in which both ends of a molecule chain silicon Should be. 본 발명의 조성물에서, 성분(C)는, 성분(A)와 성분(B)에 함유된 알케닐 그룹의 합계량 1mol당 본 성분 중의 규소-결합된 수소 원자의 함유량이 0.1 내지 10mol, 바람직하게는 0.1 내지 5mol, 특히 바람직하게는 0.5 내지 1.5mol 범위로 되도록 하는 양으로 함유되어야 한다. In the present composition, component (C), components (A) and the per total amount of the alkenyl group 1mol silicon in the component contained in (B) - the content of the bonded hydrogen atoms of 0.1 to 10mol, preferably 0.1 to 5mol, and particularly preferably to be contained in an amount such that from 0.5 to 1.5mol range. 성분(C)의 함유량이 권고된 범위의 하한 미만인 경우, 수득된 조성물의 불완전한 경화가 유도될 것이다. Component is less than if the lower limit of the recommended range of the content of (C), will be an incomplete curing of the obtained composition derived. 한편, 성분(C)의 함유량이 권고된 범위의 상한을 초과하는 경우, 당해 조성물로부터 수득된 경화물의 기계적 특성 및 내열성이 손상될 것이다. On the other hand, if it exceeds the upper limit of the recommended range of the content of the component (C), to be wound with the cured product of the mechanical properties and heat resistance obtained from the composition. 성분(D)인 하이드로실릴화 반응 촉매는 본 발명 조성물의 경화를 촉진하기 위해 사용된다. A hydrosilylation reaction catalyst component (D) is used to promote curing of the present composition. 성분(D)로는 백금계 촉매, 로듐계 촉매 및 팔라듐계 촉매를 들 수 있다. Component (D) roneun may be a platinum-based catalyst, rhodium-based catalyst and a palladium-based catalyst. 백금계 촉매는 본 발명의 조성물의 경화를 가장 효율적으로 촉진하기 때문에, 백금계 촉매를 사용하는 것이 바람직하다. Platinum-based catalyst is preferred to use a platinum-based catalyst, because promote curing of the composition of the present invention most efficiently. 백금계 촉매의 예로는, 백금 미분말, 염화백금산, 염화백금산의 알코올 용액, 백금과 알케닐실록산의 착체, 백금과 올레핀의 착체, 카보닐 함유 화합물과 백금의 착체가 있다. Examples of platinum-based catalyst, a platinum powder, a chloroplatinic acid, alcohol solutions of chloroplatinic acid, complexes of platinum and alkenyl siloxane, and a platinum-olefin complex, a carbonyl-containing compound and a platinum complex. 백금과 알케닐실록산의 착체가 가장 바람직하다. A complex of platinum and alkenyl siloxane is most preferred. 이들 목적에 적합한 알케닐실록산으로는 1,3-디비닐-1,1,3,3-테트라메틸디실록산, 1,3,5,7-테트라메틸-1,3,5,7-테트라비닐사이클로테트라실록산; The alkenyl siloxane suitable for these purposes are 1,3-divinyl-1,1,3,3-tetramethyldisiloxane, 1,3,5,7-tetramethyl--1,3,5,7- tetrahydro-vinyl cyclotetrasiloxane; 메틸 그룹의 일부를 에틸 그룹, 페닐 그룹 등으로 치환한 상기한 알케닐실록산; By substituting a part of methyl groups by ethyl groups, phenyl groups, such as the above-described alkenyl siloxanes; 비닐 그룹을 알릴 그룹, 헥세닐 그룹 등으로 치환한 상기한 알케닐실록산이 예시될 수 있다. A vinyl group may be exemplified allyl group, hexenyl alkenyl siloxane one above substituted with a group or the like. 알케닐실록산의 백금 착체의 안정성의 측면에서, 1,3-디비닐-1,1,3,3-테트라메틸디실록산을 사용하는 것이 권고된다. In terms of stability of the platinum complex of alkenyl siloxane, it is recommended to use a 1,3-divinyl-1,1,3,3-tetramethyldisiloxane. 개선된 안정성의 추가 개선의 측면에서, 상기한 착체는 1,3-디비닐-1,1,3,3-테트라메틸디실록산, 1,3-디알릴-1,1,3,3-테트라메틸디실록산, 1,3-디비닐-1,3-디메틸-1,3-디페닐디실록산, 1,3-디비닐-1,1,3,3-테트라페닐디실록산, 1,3,5,7-테트라메틸-1,3,5,7-테트라비닐 사이클로테트라실록산 또는 유사한 알케닐실록산 또는 메틸실록산 올리고머 등과 같은 오가노실록산 올리고머와 배합될 수 있다. In terms of further improvement of the improved stability, wherein the complex is 1,3-divinyl-1,1,3,3-tetramethyldisiloxane, 1,3-diallyl-1,1,3,3-tetra methyl disiloxane, 1,3-divinyl-1,3-dimethyl-1,3-diphenyl disiloxane, 1,3-divinyl-1,1,3,3-tetraphenyl-disiloxane, 1, 3, 5,7-tetramethyl--1,3,5,7- tetrahydro vinyl cyclotetrasiloxane, or may be formulated with organosilane no siloxane oligomer such as a similar alkenyl siloxane or siloxane oligomer. 알케닐실록산을 첨가하는 것이 바람직하다. It is preferable to add the alkenyl siloxane. 조성물의 경화를 촉진시키는 한, 성분(D)의 사용량은 특별히 한정되지 않는다. The amount of the component (D) to promote curing of the composition is not particularly limited. 그러나, 성분(D)는, 성분(D) 중의 금속성 원자의 함유량이 질량 단위로 0.01 내지 500ppm 범위, 바람직하게는 0.01 내지 50ppm 범위로 되도록 하는 양으로 사용하는 것이 바람직하다. However, component (D), component (D) is preferably used in an amount such that the weight of a unit content of metallic atoms range from 0.01 to 500ppm, preferably from 0.01 to 50ppm range. 성분(D)가 권고된 범위의 하한 미만의 양으로 함유되는 경우, 본 발명 조성물의 완전한 경화를 제공하는 것이 곤란할 것이다. When the component (D) is contained in an amount of less than the lower limit of the recommended range, it will be difficult to provide complete curing of the present composition. 성분(D)의 함유량이 권고된 범위의 상한을 초과하는 경우, 당해 조성물로부터 수득한 경화물에서 변색이 발생할 수도 있다. When component (D) content is more than the upper limit of the recommended range, it may cause discoloration in a cured product obtained from the composition. 본 발명의 조성물은 2-메틸-3-부틴-2-올, 3,5-디메틸-1-헥신-3-올, 2-페닐-3-부틴-2-올 또는 유사한 알킨 알콜; The compositions of the present invention 2-methyl-3-butyn-2-ol, 3,5-dimethyl-1-hexyne-3-ol, 2-phenyl-3-butyn-2-ol, or similar alkyne alcohols; 3-메틸-3-펜텐-1-인, 3,5-디메틸-3-헥센-1-인 또는 유사한 엔인 화합물; 3-methyl-3-penten-1-in, 3,5-dimethyl-3-hexene-1-a or a compound similar ene; 1,3,5,7-테트라메틸-1,3,5,7-테트라비닐사이클로테트라실록산, 1,3,5,7-테트라메틸-1,3,5,7-테트라헥세닐사이클로테트라실록산, 벤조트리아졸 또는 유사한 반응 억제제와 같은 기타 임의 성분을 함유할 수도 있다. 1,3,5,7-tetramethyl--1,3,5,7- tetrahydro vinyl cyclotetrasiloxane, 1,3,5,7-tetramethyl--1,3,5,7- tetrahydro-hexenyl cyclotetrasiloxane and it may contain other optional ingredients such as benzotriazole or similar reaction inhibitors. 이러한 반응 억제제를 사용할 수 있는 양은 특별히 한정되지 않지만, 성분(A)와 성분(B)의 합계량 100질량부당 0.0001 내지 5질량부의 양으로 첨가하는 것이 권고된다. The amount that can be used for this reaction inhibitor is not particularly limited, it is recommended to be added in an amount total amount 100 parts by mass per 0.0001 to 5 parts by mass of the components (A) and (B). 의 실록산 화합물(여기서, "d", "e", "f" 및 "g"는 양수이다); Of the siloxane compound (where, "d", "e", "f" and "g" is a positive number); 메틸폴리실리케이트; Methyl polysilicate; 에틸폴리실리케이트; Ethyl polysilicate; 또는 에폭시 함유 에틸폴리실리케이트가 있다. Or an epoxy-containing ethyl polysilicate. 이러한 접착성 부여제가 저점도 액체를 포함하는 것이 권고된다. The adhesive imparting agent, low viscosity is recommended that a liquid. 이러한 액체의 25℃에서의 점도는 특별히 한정되지 않지만, 점도가 1 내지 500mPaㆍs 범위인 것이 권고된다. Viscosity at 25 ℃ of such a liquid is not particularly limited, it is recommended that the viscosity is 1 to 500mPa · s range. 본 발명의 조성물에서 이러한 접착성 부여제를 사용할 수 있는 양은 특별히 한정되지 않지만, 일반적으로 성분(A)와 성분(B)의 합계량 100질량부당 0.01 내지 10질량부의 양으로 사용하는 것이 권고된다. The amount in the composition of the present invention to use any of these adhesion-imparting agent is not particularly limited, it is generally recommended to use an amount of the total amount 100 parts by weight per 0.01 to 10 parts by weight of the components (A) and (B). 본 발명의 목적을 손상시키지 않는 범위내에서, 본 발명의 조성물은 실리카, 유리 알루미나, 산화아연 또는 유사한 무기 충전제; Within a range that does not impair the objects of the invention, the composition of the present invention is silica, glass, alumina, zinc oxide, or similar inorganic fillers; 폴리메타크릴레이트 수지 또는 유사한 유기 수지의 미분말; Polymethacrylate resin, or a fine powder of a similar organic resin; 내열제, 염료, 안료, 난연제, 용매 등을 함유할 수도 있다. And may contain a heat-resistant agents, dyes, pigments, flame retardants, solvents and the like. 본 발명의 조성물의 25℃에서의 점도는 특별히 한정되지 않지만, 보다 양호한 충전성을 위해 본 발명 조성물의 점도는 10,000mPaㆍs 이하, 바람직하게는 5,000mPaㆍs 이하, 보다 더 바람직하게는 3,000mPaㆍs 이하인 것이 권고된다. Viscosity at 25 ℃ of the compositions of the present invention is not particularly limited, but for more satisfactory filling property viscosity of the present composition is 10,000mPa · s or less, preferably from 5,000mPa · s or less, more preferably more than 3,000mPa · s or less is recommended. 본 발명의 조성물을 경화시켜 수득한 경화물은 가시광선(589nm)에서의 굴절률이 25℃에서 1.5 이상인 것이 바람직하다. The cured product obtained by curing the composition of the invention preferably has a refractive index in visible light (589nm) or greater at 25 ℃ 1.5. 또한, 본 발명의 조성물을 경화시켜 수득한 경화물은 광투과율(25℃에서)이 80% 이상인 것이 권고된다. Further, the cured product obtained by curing the composition of the invention is recommended (at 25 ℃) a light transmittance of 80% or more. 경화물의 굴절률이 1.5 미만이거나 광투과율이 80% 미만인 경우, 이러한 조성물의 경화층으로 피복된 반도체 소자를 함유하는 반도체 디바이스에 충분한 신뢰성을 부여할 수 없다. The cured refractive index less than 1.5, or if the light transmittance is less than 80%, it is impossible to impart sufficient reliability to a semiconductor device comprising a semiconductor element coated with a cured layer of such a composition. 높은 굴절률과 높은 광투과율을 갖는 경화물을 제조할 수 있는 목적하는 경화성 오가노폴리실록산을 수득하기 위해, 성분(A) 내지 성분(D)의 모든 성분은 굴절률이 거의 동일한 것이 권고된다. To obtain a curable organopolysiloxane desired to prepare a cured product having a high refractive index and high light transmittance, the components of the components (A) to component (D) it is recommended that the refractive index is substantially the same. 보다 구체적으로는, 규소-결합된 유기 그룹의 40mol% 이상, 바람직하게는 45mol% 이상이 아릴 그룹이고, 당해 아릴 그룹과 알케닐 그룹 이외의 규소-결합된 유기 그룹이 알킬 그룹, 특히 메틸 그룹을 포함할 수 있는 오가노폴리실록산 형태의 성분(B)를 사용하고; More specifically, the silicon-bonded and 40mol% of the organic groups, preferably at least 45mol% are aryl groups, the art aryl group and the silicon other than the alkenyl group, - the alkyl group combined organic group, especially a methyl group which may include the organosilane used in the form of an organopolysiloxane component (B), and; 규소-결합된 그룹의 10mol% 이상이 아릴 그룹이고, 당해 아릴 그룹 이외의 규소-결합된 유기 그룹이 알킬 그룹, 특히 메틸 그룹인 오가노폴리실록산 형태의 성분(C)를 사용하는 것이 바람직하다. Silicon - it is preferred to use the alkyl group bonded organic groups, especially methyl groups, the organopolysiloxane in the form of component (C) - and 10mol% or more of the combined groups is an aryl group, an aryl group other than the silicon art. 굴절률은, 예를 들면, 아베식(Abbe-type) 굴절률계에 의해 측정할 수 있다. The refractive index, for example, can be measured by the Abbe formula (Abbe-type) refractometer. 이 경우, 아베식 굴절률계에 사용된 광원의 파장을 변경함으로써 임의 파장의 광의 굴절률을 측정할 수 있다. In this case, it is possible to measure the refractive index of light of an arbitrary wavelength by changing the wavelength of the light source used in the Abbe type refractometer. 광투과율은, 예를 들면, 광로가 1.0mm인 경화물에서, 분광광도계에 의해 측정할 수 있다. The light transmittance of, for example, from the cured product of the optical path is 1.0mm, can be measured by a spectrophotometer. 본 발명의 조성물의 경화에 사용된 방법은 특별히 한정되지 않으며, 경화 반응은 실온에서 또는 가열에 의해 실시할 수 있다. The methods used in the curing of the compositions of the present invention is not particularly limited, and the curing reaction can be carried out by heating or at room temperature. 경화 공정을 촉진시키기 위해는 가열에 의한 경화가 바람직하다. In order to facilitate the curing process is preferably cured by heating. 가열 온도는 50 내지 200℃ 범위일 수 있다. The heating temperature may be 50 to 200 ℃ range. 본 발명의 조성물을 경화시켜 수득한 경화물은 엘라스토머 형태, 특히 겔상 형태 또는 유연한 고무 형태로 제조될 수 있다. The cured product obtained by curing the composition of the present invention can be prepared in the form of elastomer, in particular a gel form or in the form of a flexible rubber. 겔상 형태가 바람직하다. The gel form is preferred. 겔상 경화물은, JIS K 2220에 규정된 1/4 조도(consistency)가 5 이상, 바람직하게는 5 내지 200 범위여야 한다. Gel-like cured product, it is should be in the range 5 to 200, preferably 5 or more, the 1/4 luminance (consistency) as specified in JIS K 2220. 본 발명의 조성물은 전기 및 전자 소자에 관련하여 접착제, 포팅제(potting agent), 보호 피복물 및 하부 충전제로서 사용할 수 있다. The compositions of the invention can be used in conjunction with electrical and electronic devices as an adhesive, potting the (potting agent), protective coatings and the lower the filler. 특히, 본 발명의 조성물은 광학 반도체 소자용의 접착제, 포팅제, 보호 피복물 및 하부 충전제로서의 사용에 적합하다. In particular, the compositions of the present invention are suitable for use as adhesives, potting agents, protective coating and the bottom of the filler for optical semiconductor elements. 다음에, 본 발명의 반도체 디바이스에 대해 상세하게 설명한다. Next, a detailed description of the semiconductor device of the present invention. 본 발명의 반도체 디바이스는, 상기한 경화성 오가노폴리실록산 조성물의 경화물에 의해 피복된 반도체 소자를 갖는 것을 특징으로 한다. A semiconductor device of the present invention is characterized in that the above-described curable organosilane having a semiconductor element coated with a cured product of the organopolysiloxane composition. 이러한 반도체 소자는 발광용 디바이스, 수광용 디바이스 또는 유사한 광학 반도체 소자를 포함할 수도 있다. The semiconductor device may comprise a device, light-receiving devices or similar optical semiconductor device for light emission. 광학 반도체 소자의 통상적인 예는, LED(발광 다이오드) 칩이거나, 액체 상으로부터의 성장 또는 MOCVD(Metal Organic Chemical Vapor Deposition: 금속 유기 화학 증착)에 의해 기판 위에 형성되고 발광층을 갖는 InN형, AlN형, GaN형, ZnSe형, SiC형, GaP형, GaAs형, GaAlAs형, GaAlN형, AlInGaP형, InGaN형, AlInGaN형 등의 반도체이다. A typical example of an optical semiconductor element, LED (light emitting diode) chip, or, the growth or MOCVD from the liquid phase: InN having a light emitting layer formed on the substrate by (Metal Organic Chemical Vapor Deposition of metal organic chemical vapor deposition) type, AlN type a semiconductor such as GaN type, ZnSe type, SiC-type, GaP-type, GaAs type, GaAlAs type, type GaAlN, AlInGaP type, InGaN type, type AlInGaN. 본 발명의 반도체 디바이스는, 예를 들면, 표면 실장형 발광 다이오드(LED) 및 디바이스로 예시되며, 여기서, 광학 반도체 소자(예: LED 칩)는 내열성 유기 수지(예: 폴리프탈아미드 수지, 폴리페닐렌 설파이드 수지 또는 폴리에테르니트릴 수지)로 제조된 케이스의 오목부에 배치되고, 상기한 케이스 내에서 상기한 오가노폴리실록산 조성물의 투명한 경화물로 밀봉된다. A semiconductor device of the present invention include, for example, the surface mount light-emitting diode (LED), and is exemplified by the device, wherein the optical semiconductor element (e.g., LED chips) are heat-resistant organic resin (such as polyphthalamide resin, a polyphenylene sulfide is disposed in the resin or polyether nitrile recess of the case made of resin), it is sealed in the above-described case of a transparent cured product of the aforementioned organopolysiloxane composition. 상기한 구조에서 사용된 경화성 오가노폴리실록산 조성물은 엘라스토머 형태 및 바람직하게는 겔 또는 연질 수지 형태의 경화물; The curable organopolysiloxane composition forms an elastomer and preferably a gel or a soft resin used in the form of a cured product of the above-described structure; 바람직하게는 JIS K 2220에 규정된 1/4 조도가 5 이상, 바람직하게는 5 내지 200 범위인 겔상 경화물을 형성할 수 있다. Preferably, it is possible to form a 1/4 roughness is less than 5, preferably 5 to 200 range in the gel cured product specified in JIS K 2220. 경화 동안, 상기한 오가노폴리실록산 조성물은 당해 조성물이 접촉하고 있는 부분, 즉 내열성 유기 수지, 반도체 소자(예: LED 칩), 내부 리드, 본딩 와이어 등에 강력하게 접착한다. During curing, the aforementioned organopolysiloxane composition is a portion in contact the composition, that is, heat-resistant organic resin, the semiconductor device (for example: LED chips), strongly adhesive or the like the internal lead, a bonding wire. 상기한 구조물에 사용된 LED는 쉘형 LED일 수 있다. The LED used in the above-described structure may be a shell-like LED. LED 이외의 다른 디바이스의 예로는 광커플러 및 전하-커플링 장치(CCD)가 있다. Examples of other devices other than the LED of the optical coupler and a charge-coupling device (CCD). 추가로, LED는 렌즈 장착형 또는 렌즈 비장착형일 수 있다. In addition, LED can be a lens or lens-mounted non-mounted. 렌즈 비장착형 LED의 예는 도 1에 도시되어 있다. Examples of the non-lens-mounting LED is shown in Fig. 당해 디바이스는 LED 칩(2)을 포함하며, LED 칩(2)은 내부 리드(3) 상부의 폴리프탈아미드(PPA) 수지 케이스의 중심부 위에 배치되고, 내부 리드(3)는 케이스(1)의 측벽으로부터 케이스의 중심을 향하여 연장한다. And art device comprises a LED chip 2, the LED chip 2 is disposed on the center of the polyphthalamide (PPA) resin case of the upper inner leads 3, the inner leads 3 of the case 1 and it extends toward the center of the case from the side wall. LED 칩(2)과 내부 리드(3)은 본딩 와이어(4)에 의해 전기적으로 접속된다. LED chip 2 and the inner leads 3 are electrically connected by a bonding wire (4). 본 발명의 실시예에서, 폴리프탈아미드(PPA) 수지 케이스(1)의 내부에는 본 발명의 실시예에 사용된 경화성 오가노폴리실록산 조성물이 충전되어 있다. Interior of the embodiment of the present invention, the polyphthalamide (PPA) resin case 1, there is a curable organopolysiloxane composition used in the embodiment of the present invention filled. 경우에 따라, LED에는 투광성 재료로 제조된 렌즈가 장착될 수 있다. In some cases, LED, it can be a lens made of a transparent material fitted. 당해 충전제가 열에 의해 경화되는 경우, 이는 투명한 경화물(5)을 형성한다. When the filler is cured by heating the art, which form a transparent cured product (5). 본 발명의 경화성 오가노폴리실록산 조성물 및 반도체 디바이스를 실시예와 비교 실시예에 의해 상세하게 설명한다. This will be described in detail by the curable organopolysiloxane composition and semiconductor device of the invention in Examples and Comparative Examples. 이들 실시예에서 모든 점도 값은 25℃에서 측정한 값이다. All viscosity values ​​in the examples is a value measured at 25 ℃. 경화성 오가노폴리실록산 조성물 및 이의 경화물의 특성을 다음과 같이 측정하고, 측정 결과를 표 1에 나타낸다. 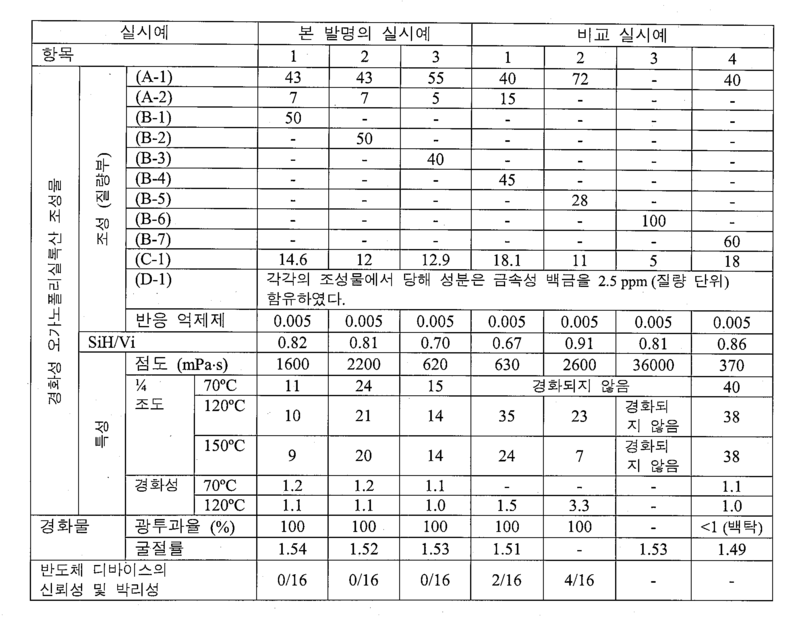 Measured as the curable organopolysiloxane composition and the cured properties thereof follows, The measurement result is shown in Table 1. 경화성 오가노폴리실록산 조성물의 경화성은, 조성물 샘플을 70℃, 120℃ 및 150℃에서 열풍 순환식 오븐으로 1시간 동안 경화시키고, 1시간 동안 150℃에서 경화된 경화물에서 측정한 JIS K 2220에 따르는 1/4 조도를 70℃ 및 120℃에서 경화된 경화물에서 수득한 1/4 조도로 나누어, 경화성 지수를 측정함으로써 평가하였다. Curable organo polysiloxane composition-curing is a composition sample was cured for one hour in a hot air circulation oven at 70 ℃, 120 ℃ and 150 ℃, according to a JIS K 2220 measured on the cured product cured at 150 ℃ for 1 hour 1/4 roughness 70 ℃ and divided by a 1/4 illumination obtained in the cured product cured at 120 ℃, was assessed by measuring the curing index. 수득된 지수가 1에 가까워질수록, 수득된 경화성 오가노폴리실록산 조성물의 경화성은 더욱 양호한 것이다. The resultant exponential closer to 1, the obtained curable organosilane curing of the organopolysiloxane composition is more preferable. 조성물 샘플을 70℃, 120℃ 및 150℃에서 열풍 순환식 오븐으로 1시간 동안 경화시켜 경화물을 수득하였으며, 수득된 경화물의 1/4 조도는 JIS K 2220에 따라 측정하였다. A composition sample afforded a 70 ℃, cargo light cured for one hour in a hot air circulation oven at 120 ℃ and 150 ℃, 1/4 roughness obtained cured product was measured according to JIS K 2220. 경화성 오가노폴리실록산 조성물의 샘플을 120℃에서 열풍 순환식 오븐으로 1시간 동안 가열하여 경화시키고, 수득된 경화물을 통과하는 광의 굴절률을 25℃에서 아베식 굴절률계로 측정하였다. Curable organo polysiloxane composition of the sample was cured by heating for 1 hour in a hot air circulation oven at 120 ℃, the refractive index of the light passing through the obtained cured product was measured at 25 ℃ to step Abbe refractive index expression. 측정에 사용된 광원의 가시광선은 파장이 589 nm이었다. Visible light of the light source used for measurement was a 589 nm wavelength. 경화성 오가노폴리실록산 조성물의 샘플을 120℃에서 열풍 순환식 오븐으로 1시간 동안 경화시켜 수득한 경화물(광로 길이 1.0mm)에서 가시광선(파장: 420nm)의 광투과율(25℃)을 측정하였다. Curable organo polysiloxane composition of the sample in a hot air circulation oven at 120 ℃ cured product obtained by curing for 1 hour (the optical path length 1.0mm) in the visible light: the light transmittance (25 ℃) (wavelength 420nm) was measured. 본 발명의 경화성 오가노폴리실록산 조성물을 사용한 표면 실장형 LED를 다음에 기재한 바와 같이 제조하였다. A curable organopolysiloxane, surface-mount LED with a composition of the present invention was prepared as described in the following. 당해 LED의 신뢰성은 다음에 기재한 방법으로 평가하였으며, 평과 결과는 표 1에 제시되어 있다. Reliability of such LED was evaluated by the method described in the following, evaluation results are shown in Table 1. LED 칩(2)을, 원통형 폴리프탈아미드(PPA) 수지 케이스(1)의 측벽으로부터 중심부로 연장하는 내부 리드 상부의 16개의 원통형 폴리프탈아미드 수지 케이스(1)(내부 직경: 2.0mm, 깊이: 1.0mm)의 바닥의 중심부에 배치하였다. The LED chip (2) to the cylindrical polyphthalamide (PPA) resin sixteen cylindrical polyphthalamide resin case of the upper inner leads extending toward the center from the side wall of the case (1) (1) (inside diameter: 2.0mm, depth: It was placed in the center of the bottom of 1.0mm). 내부 리드와 LED 칩을 본딩 와이어에 의해 전기적으로 접속시키고, 수지 케이스(1)의 내부를, 후속되는 실시예 또는 비교 실시예에 사용된 탈포된 오가노폴리실록산 조성물로 분산기에 의해 충전시켰다. Connecting the internal lead and the LED chip is electrically by the bonding wires and was charged by the inside of the resin case (1), the dispersing machine to a degassing the organopolysiloxane composition used in the exemplary embodiment which follows Example or Comparative Example. 조성물을 1시간 동안 120℃에서 유지시켜 경화시킴으로써, 도 1에 도시된 형태의 표면 실장형 LED 16개를 제조하였다. By curing by maintaining the composition at 120 ℃ for 1 hour, to thereby prepare a surface-mounted type LED 16 of one shown in Fig. 상기 방법으로 제조한 표면 실장형 LED 16개를, 280℃에서 30초 동안 유지, -40℃에서 30분 동안 유지 및 100℃에서 30분 동안 유지하는 것을 1개 주기로 하는, 5회 반복되는 열 주기 시험으로 처리하였다. Heat cycle is a surface-mount LED 16 gae prepared by the above method, repeated in 280 ℃ for 30 seconds, and held at 100 ℃ while at -40 ℃ 30 minutes to 30 minutes to maintain a cycle for one, 5 It was treated with the test. 이어서, 이들 샘플을 실온(25℃)에서 유지시키고, 폴리프탈아미드(PPA) 수지 케이스(1)의 내벽에 대한 경화물의 접 착 상태를 광학 현미경으로 관찰하였다. Subsequently, these samples were kept at room temperature (25 ℃), a cured adhesive state on the inner wall of the water polyphthalamide (PPA) resin case (1) was observed with an optical microscope. 박리성 계수는 LED의 전체 갯수(16)에 대한, 당해 케이스(1)의 내벽으로부터 경화물이 박리한 LED 갯수의 백분율로서 측정하였다. Releasable coefficient was measured as a percentage of the number of LED which the cured product released from the inner wall of the, art case 1 to the total number 16 of the LED. 경화성 오가노폴리실록산 조성물은 하기 성분들을 표 1에 도시된 비율(질량비)로 혼합하여 제조하였다. The curable organopolysiloxane composition was prepared by mixing in a ratio (by weight) the following components shown in Table 1. 표 1에서, [SiH/Vi]는, 비닐 그룹을 갖는 오가노폴리실록산 성분 중의 비닐 그룹 1mol에 대한, 규소-결합된 수소 원자를 함유하는 오가노폴리실록산에 함유된 규소-결합된 수소 원자의 몰 수의 비율이다. In Table 1, [SiH / Vi] is the vinyl group of the organopolysiloxane component a vinyl group on 1mol, silicon in which - contained in the organopolysiloxane containing bonded hydrogen atoms silicon-molar number of hydrogen atoms bonded the ratio. 본 발명의 경화성 오가노폴리실록산 조성물은, 전기 및 전자 소자와 관련하여, 접착제, 포팅제, 보호 피복물 및 하부 충전제로서 사용하기에 적합하다. The curable organopolysiloxane composition of the present invention, with respect to electrical and electronic devices, and is suitable for use as an adhesive, potting agent, protective coating and the lower the filler. 특 히, 광투과율이 높은 측면에서, 광학 반도체 소자용의 접착제, 포팅제, 보호 피복물 및 하부 충전제로서 사용하기에 적합하다. In particular, it is suitable for a high light transmission side, used as an adhesive, potting agent, protective coating and the bottom of the filler for optical semiconductor elements. 본 발명의 반도체 디바이스는 다이오드, LED, 트랜지스터, 사이리스터(thyristor), 광커플러, CCD, 모노리틱 IC, 하이브리드(hybrid) IC, LSI 및 VLSI의 형태로 실현될 수 있다. A semiconductor device of the present invention can be realized in the form of a diode, LED, transistor, thyristor (thyristor), the optical coupler, CCD, monolithic IC, hybrid (hybrid) IC, LSI, and VLSI. 당해 조성물을 경화시키기에 충분한 양으로 사용되는 하이드로실릴화 반응 촉매(D)를 적어도 포함하는, 경화성 오가노폴리실록산 조성물. Art including the hydrosilylation reaction catalyst (D) is used in an amount sufficient to cure the composition, at least, the curable organopolysiloxane composition. 제1항에 있어서, 성분(B)가, R 2 중의 40mol% 이상을 아릴 그룹으로서 갖는 오가노폴리실록산인, 경화성 오가노폴리실록산 조성물. The method of claim 1 wherein component (B), the organopolysiloxane of the curable organopolysiloxane composition having 40mol% or more of R 2 as an aryl group. 제1항에 있어서, 성분(C)가, 분자 말단 둘 다에 규소-결합된 수소 원자를 갖는 직쇄 오가노폴리실록산인, 경화성 오가노폴리실록산 조성물. The method of claim 1 wherein component (C) is a silicon on both molecular terminals - a straight-chain organopolysiloxane of the curable organopolysiloxane composition with a bonded hydrogen atom. 제1항에 있어서, 상기 경화성 오가노폴리실록산 조성물이 점도가 25℃에서 10,000mPaㆍs 이하인, 경화성 오가노폴리실록산 조성물. The method of claim 1 wherein the curable organopolysiloxane composition is not more than a viscosity of 10,000mPa · s at 25 ℃, the curable organopolysiloxane composition. 제1항에 있어서, 상기 경화성 오가노폴리실록산 조성물을 경화시켜 수득한 경화물의 가시광선(589nm)에 대한 굴절률이 25℃에서 1.5 이상인, 경화성 오가노폴리실록산 조성물. According to claim 1, wherein the refractive index for the cured product of the visible light (589nm) obtained by curing the curable organopolysiloxane composition at less than 25 ℃ 1.5, the curable organopolysiloxane composition. 제1항에 있어서, 상기 경화성 오가노폴리실록산 조성물을 경화시켜 수득한 경화물의 광투과율이 25℃에서 80% 이상인, 경화성 오가노폴리실록산 조성물. The method of claim 1 wherein the curable organopolysiloxane composition of the cured product cured by light transmittance obtained by the two or more at 25 ℃ 80%, the curable organopolysiloxane composition. 제1항에 있어서, 상기 경화성 오가노폴리실록산 조성물을 경화시켜 수득한 경화물이 겔상 경화물인, 경화성 오가노폴리실록산 조성물. The method of claim 1, wherein a cured product obtained by curing the curable organopolysiloxane composition is water gel hardening, the curable organopolysiloxane composition. 제1항에 있어서, 상기 경화성 오가노폴리실록산 조성물을 경화시켜 수득한 경화물의 JIS K 2220에 규정된 1/4 조도가 5 내지 200 범위인, 경화성 오가노폴리실록산 조성물. According to claim 1, wherein the roughness is from 5 to 1/4 200 in the range defined by JIS K 2220 of the cured product obtained by curing the curable organopolysiloxane composition, the curable organopolysiloxane composition. 제1항 내지 제8항 중의 어느 한 항에 따르는 경화성 오가노폴리실록산 조성물의 경화물로 피복된 반도체 소자를 포함하는, 반도체 디바이스. Claim 1 to a semiconductor device comprising a semiconductor element coated with a cured product of the organosilane curing organopolysiloxane composition according to any one of claim 8. 청구항 10은(는) 설정등록료 납부시 포기되었습니다. Claim 10 is set when the registration fee has been paid to give up. 제9항에 있어서, 상기 반도체 소자가 발광 소자인, 반도체 디바이스. 10. The method of claim 9, wherein the semiconductor element is a light emitting device, the semiconductor device.